Animal lovers' hearts will melt when they see this sweet, sleeping lion, captured so beautifully in this photograph by Carrie. This one is for your dog loving friends! Every month, your recipient receives a box of at least four dog products and presents, based on the size of their dog (examples here). Both dog and owner will love you. :) Sweet bonus: 10% of profits are donated to dogs in need! Sooo squishables are my current biggest obsession. Tons of animals who have been squishified and are ready to be adopted! My favorites are the 15" squishables, but the 7" mini squishables also make good gifts for anyone who lives in a smaller place or if you're bringing your gifts to travel for the holidays. I first discovered Jessica's shop in college and it was my first inspiration toward eventually starting my own business. I'll write out my full story on here sometime. But, basically, Jessica makes the coolest clothing. I own quite a few pieces. And she has a few dog collars available in her Etsy shop for furry friends! This would be perfect for anyone in your life who (like one of my best friends) is elephant-obsessed! The Elephant Santuary is a haven for endangered African and Asian elephants. This little bunny will win the heart of any bunny lover! SSCS is an international, non-profit, marine wildlife conservation organization. 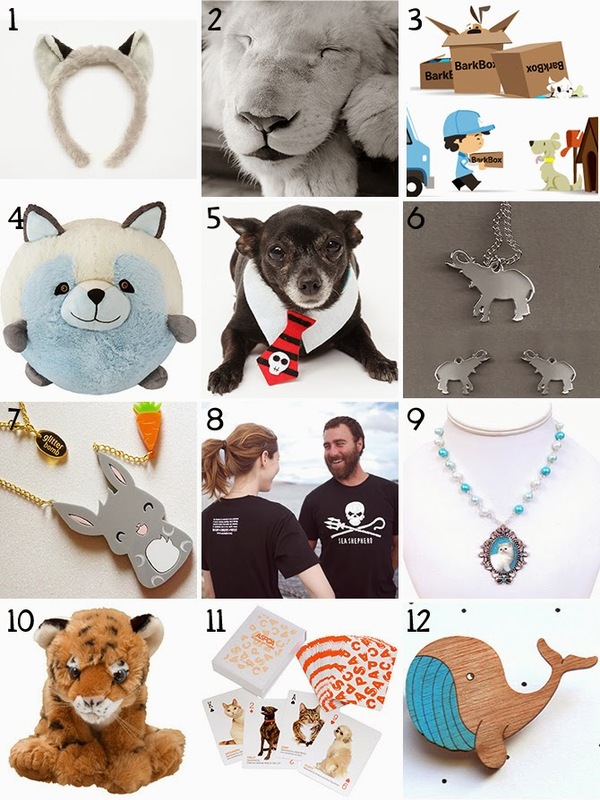 They have a whole store of goodies that would make great gifts for the marine animal lover in your life. I'm loving the badass skull logo too! I have way more Locketship than I'd care to admit (see pieces worn in outfits here and here). Maria has some super cute, whimsical cat and dog cameo jewelry available in her shop. For a cute, $5 stocking stuffer, check out her crazy cat lady 3" mirror. The funds for these kits go to WWF, who work to support conservation efforts and to be the voice of the animals. I think the tigers are extra cute, but WWF has a huge range of other species adoption kits available also. Choose the recipient's favorite animal and get them one of these! Includes a plush version of the adopted animal, adoption certificate, 5" x 7" species photo, fact card, personal acknowledgement letter, and free priority shipping. Other kits are available in prices ranging from $25 - $250. If you're donating on behalf of a loved one who lives far away, you can use the gift adoption card to e-mail the recipient a code they can redeem for any adoption kit! The American Society for Prevention of Cruelty to Animals works to care for pet parents and pets, assist at-risk animals, and serve victims of animal cruelty. This card deck features photos of ASPCA Onyx and Breezy Shefts Adoption Center animals, with a card back design by Isaac Mizrahi. I love this little proud whale! So Little Time Co pieces are made from laser-cut wood, then hand-painted. Your guides are seriously the best I've seen! The bunny necklace (7) is adorable! Thanks, Jessica! <3 Yesss I'm in love with Glitter Bomb UK's work! I'm really tempted to get that bark box for my pups!